This post is the second part of an ongoing series, Growth Tactics You Need To Be Following. I have ten new growth channels and tactics I am watching. I am going to publish half publicly, and half privately to my email list. If you want to get all of them, make sure you subscribe. Even with all of the complaints about tabbed inboxes email overload, email will remain a powerful marketing channel. The impact of tabbed inboxes on marketing emails has been minimal thus far (however we’ll see what happens over time). But more importantly email is still a place where we go to get things done, especially in our professional lives, which makes it a phenomenal place to reach our customers. At the core, Gmail actions reduces the friction of this flow. As a general principle, as you reduce friction you increase conversion. So how does this impact growth? Growth is a function of the full funnel. If I’m sending an email to try and increase retention by getting the user to come back and take an action, reducing the friction to take that action should hopefully increase retention and therefore growth. Lets look at a specific example from one of my favorite new products, Quibb. But what if you could eliminate step 3? With Gmail actions it would be possible for me to reply to the comment, like the comment, or follow the person with out ever leaving my email. My hypothesis is that this would increase conversion to those actions. The more those actions are taken, the more email notifications that are triggered to other users. My hypothesis is that the reduced friction will lead to more shares, which will increase acquisition of more readers. User Receives Daily Email —> User Clicks On Deal In Email —> User Gets Taken To Deal Page —> User Clicks On Purchase Deal —> User Completes Purchase of deal. Once again, gmail actions reduces friction, and hypothetically increasing revenue, and therefore growth. Like many changes in the tech ecosystem, mobile is a huge driving force behind why email actions will be so powerful. 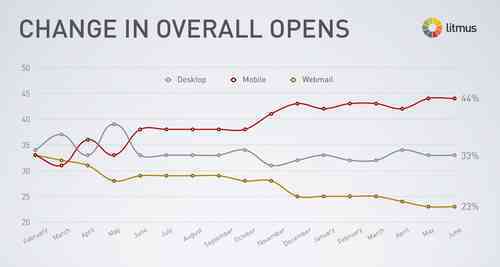 44% of emails are now opened on a mobile device (more than web or desktop apps). Clicking out of an email, into a new experience and completing action is a lot more painful on a mobile device. It is so painful in fact that I often find myself saving emails in my inbox (or just deleting them all together) because I don’t want to take the action on my mobile device. Being able to take that action directly in my email interface on a mobile device would reduce a lot of friction and increase conversion. As email actions become prominent we will need to start thinking about how we measure the effectiveness of emails. Open rate and CTR are the focus of email measurement today. But those metrics are kind of useless unless we get a user to convert to a meaningful action post click. Email actions will tie measuring these meaningful actions more closely with the emails we send. The optimist in me hopes that this will drive an ecosystem change of a more relevant inbox. What Could Hold Email Actions Back? At the moment actions are a Gmail only feature. While Gmail is the most used email provider, Yahoo, Hotmail/Outlook still have significant market share. I expect other email providers to follow Gmail’s lead and implement actions. But if they decide to be slow dinosaurs, it could limit the potential of email actions as a growth tactic. Gmail has currently restricted actions to a few very specific use cases. My sense is that this will expand, and at some point hopefully be an open API where tools can build custom actions. But if they don’t expand the use cases it could limit the growth potential. To learn about more growth tactics I’m keeping my eye on, subscribe to my newsletter. If you learned anything from this post, I greatly appreciate retweets or comments/votes on Quibb.